Our Honorable Prime Minister Shri Narendra Modi visited Brussels on Wednesday, the 30 March 2016 to attend the European Union – India Summit. 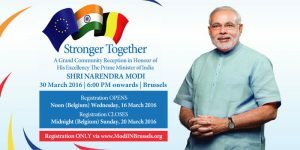 This was the first visit of our PM Narendra Modi to Belgium after becoming the Prime Minister. To honour our Prime Minister a Grand Community Reception was held in the evening of March 30, 2016 and the EICC had an honour to be the closest collaborator in organising this Reception. As the concluding event of his day-long tour in Brussels, Prime Minister Narendra Modi addressed the Indian diaspora in Brussels and paid tribute to the victims of the terror attacks in which over 30 people, including an Indian, lost their lives. Around 5,000 members of the Indian community reached the Brussels Expo Community Reception.This was an historic moment for Indian Diaspora in Belgium to welcome our Prime Minister Shri Narendra Modi. The visit of an Indian Prime Minister to Belgium took place after a gap of six years (Prime Minister Dr. Manmohan Singh visited Brussels from 9-11 December 2010 to attend the EU-India summit), assumed great ignificance of the visit of PM Modi to Belgium for us and an opportunity to show to the global Indian Community the vibrancy and importance of Indian Diaspora in Europe. This reception was held in the evening of March 30, 2016 (1800 hrs at Hall No. 12, (Palais 12) Brussels Expo (near Atomium, Brussels).